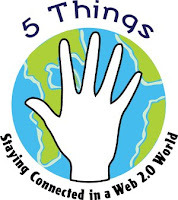 The Bucks County Free Library is offering free classes as part of its 5 Things project aimed at teaching adults who want to learn how to use the Internet to stay in touch with family, friends and their community. Classes will be led on topics like email, Facebook, blogging, Twitter, digital photography and photo sharing. I recently became involved with the initiative and wanted to share its mission with our local readers. Two weeks ago, I attended an all-day training session on how to effectively lead classes on the various social media tools. Volunteers from all walks of life attended. We went over the presentations that will be available for training and discussed typical questions that we may encounter during a class. A big part of my job here at Furia Rubel is staying on top of trends in the social media realm. This volunteer opportunity allows me to combine my love of social media, give back to the community and utilize my teaching skills that I honed while living in Madrid teaching English as a Second Language.